A wi-fi music device developed for audiophiles will offer better audio output than CD players, says its maker. Transporter is being billed as the world's first network music player for lovers of pure sound. The $1,999 (£1,079) player is aimed at people who encode music using so-called lossless formats, such as Flac or Wav. Many people who rip their CDs onto a computer use formats such as MP3, AAC or WMA - all of which compress the audio, losing quality in the process. Digital music files stored on a computer can be streamed over a wi-fi network to Transporter, which plugs into an amplifer and speakers. Patrick Cosson, from US manufacturer Slim Devices, said: "Audiophiles are investing a lot of money to rip their files at more than simple 128kbps MP3." He said many people did not realise what a compromise they were making when ripping CDs into formats such as MP3. "People have not been trained. MP3s are stuff you listen to at the gym. "Audiophiles do not see digital music as throwaway music - which is what digital music has become to some people." The strength of the Transporter lies in its digital to analogue converter (DAC), the chip which converts digital information into the analogue sound that emerges from an amplifier and speakers. Mr Cosson said Transporter was using a "miracle DAC" typically found in devices costing up to $10,000. Are you happy with the audio quality of MP3 files? Slim Devices said Transporter's DAC is of a higher quality than those used even in expensive CD players, resulting in better audio performance. "We want people to take advantage of good file formats," he said. Flac and Wav are the favoured formats of many digital audiophiles because they retain all the information on a CD when converted or transferred into digital or non-physical form. There are also lossless version of WMA and iTunes also includes a lossless encoder for making perfect digital copies of the songs on CDs. "The digital audio market is an evolutionary process. A good healthy chunk of our business is with audiophiles," said Mr Cosson. Slim Devices' core product line is the Squeezebox, a $299 network wi-fi music player aimed at a developing mass market. "We have had one product for all seasons. We needed to better match our customers' needs. "Wireless music is not quite mass market. 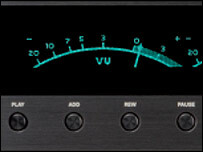 It has not taken off yet but the audiophile market has." Slim Devices estimates that 20% of its near 50,000 customers are audiophiles. "Transporter sounds better than most CD players. This surpasses even the most exotic CD player," he said. Ultimately, the quality of the sound the customer eventually hears will be determined by the amplifier and speakers being used. Mr Cosson said: "Lessons we have learned with this product will trickle down to our mainstream products. "We are an audio company. We are audio geeks."